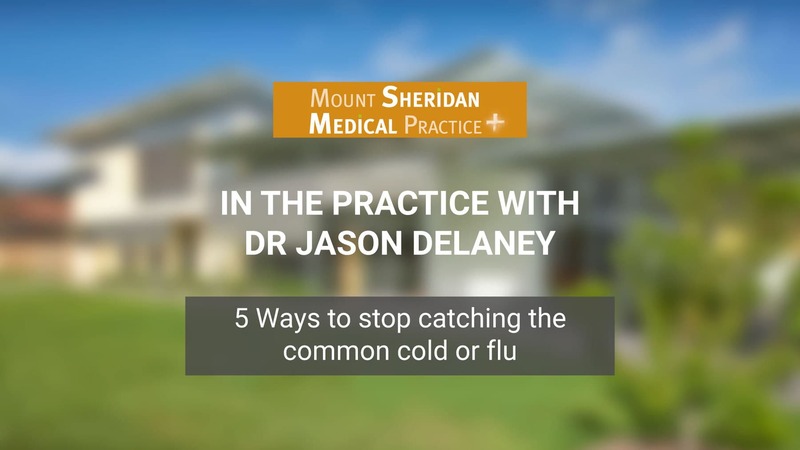 Dr Jason Delaney from Mount Sheridan Medical Practice discusses the difference between the common cold and the flu. So, what’s the difference between the common cold and the flu? Well, the common cold is often due to a virus called Rhinovirus. But a number of other viruses as well can cause a common cold. With the common cold, you get the runny nose, the cough and aches and pains sometimes but it tends to be an illness that is slower in onset and is it usually not as severe as influenza. Influenza is due to the Influenza viruses, there are a couple of different strains, usually we break it down into strain A or B and it is a much more rapid onset illness. Usually, you might be just starting to feel unwell but within 24 hours you will be sick and in bed with the flu. So, it’s not a disease that hangs on for a few days and then you get sicker, that’s normally the cold. But in reality the flu has a wide spectrum of the illness, some people only have a very mild illness, while others can get very unwell with it. If we look back in history, we have had a lot of flu epidemics and one of the big ones was in 1918. It’s estimated that 25 million people around the world died from the flu, perhaps as many as 10-20% of people who got infected, died from the flu that year. Now, that was partly because our medical care was nowhere near as good as it is today and we certainly wouldn’t expect that sort of number. But that is why we get worried about flu outbreaks and why we encourage people to get immunised, especially if you are someone at increased risk of becoming very unwell if you get the flu virus. Can you catch the common cold and the flu the same way? The cold virus and influenza are both caught the same way, by other people that are unwell coughing or sneezing, spreading the virus onto yourself or onto other objects which you then touch and then touch your mouth or nose and inoculate yourself with the virus. What are the key differences in symptoms between the cold and the flu? The key differences in the symptoms are more to do with the onset of the illness, the two illnesses can appear very similar. Influenza appears to be a more rapid onset illness. Mild influenza is very hard to tell apart from the common cold. Whereas severe Influenza you are more likely to get the full range of symptoms. So, you get the runny nose, sore throat, headache, aches and pains, often get stomach upset, feeling a bit nauseous with it and it is one that comes on within 24 hours rather than a slower onset. What is the most common complication from the flu? So, the most complication we see from the influenza virus would be pneumonia, where an infection goes down into the lungs and makes you more unwell, it affects your breathing, things like that. Can I get complications from a common cold similar to the flu? You can get complications from a common cold, you can still go on and develop pneumonia and other infections but it is less common than it is with influenza. If you would like more information or you would like to book your flu shot, click the button below.